The St. John community coming together to remember one man. “Anytime I needed him for anything, he was there. You know, your car window won’t roll up, Rehugh is there. You need a ride home at 3 o’clock in the morning, Rehugh was there. Anything that you could ever possibly need,” Siobhan Mulvey helped coordinate the benefit for Rehugh Hendricks. Hendricks passed away suddenly on October 2. He was 45 years old. But family and friends in Cruz Bay Tuesday said those 45 years were full of life. And that anyone who stepped foot on this island, tourist or local, knew him. “For ex-patriots like myself, I moved down here from Ohio 22 years ago he was one of the first people to extend his hand and make me feel welcome on the Island. And, uh, we just hope we could have a good time in his memory tonight,” Demetrios “DJ” Ahlavis one of the organizers of the event said. St. Johnians bonded together in the weeks after his death to plan a fundraiser that would help Hendricks family cover funeral costs. It quickly turned into a celebration of his life. “He was everyone’s best friend, just a genuinely good person,” Derek Athanase a close friend of Hendricks said. People came from all over for the event. From the mainland, on the ferry from St. Thomas and in St. John. Friends and family said he was the embodiment of St. John and always had a smile on his face. “I think that somewhere up there he is having his own little party and I think that he would be happy to see he was able to make all these different people come together,” Mulvey added. All of them pitched in to help. They all were from different restaurants or shops, but all worked together for this. 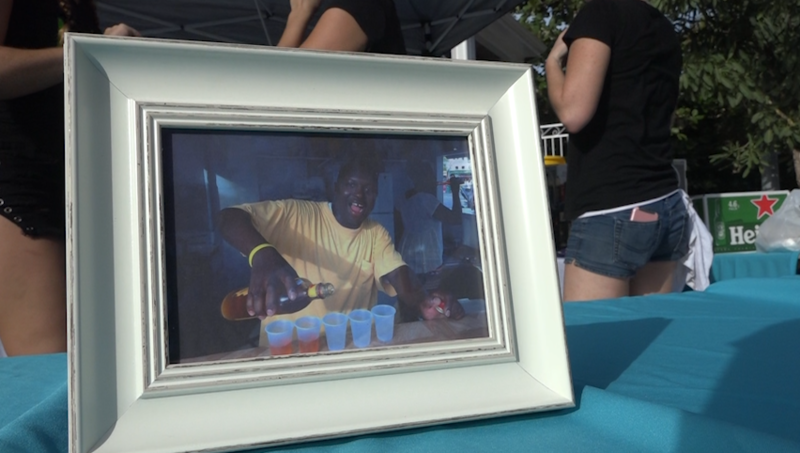 The benefit was held on what would have been Hendricks 46thbirthday. “To see this it tells me that people care, and it’s what he would want, it’s what he would want and what he is in all of us, our memories of him. So to see the community here coming out for this it just says Love City,” Athanase said. His smile, his charm, his personality, had such an impact on so many in St. John. Now they want to keep that feeling going, in his honor. “The island is always changing. Economic development to major catastrophes, if we don’t keep that part of us, that little bit of our spirit inside that is so important to remember why we came here and why individuals who were lucky enough to have been born here are here. It is love city it truly is. I never felt more apart of the community than I do today,” Ahlavis said. Even, after he’s gone, Hendricks continues to bring the community together.